Have you ever considered having nose reconstruction, or rhinoplasty– commonly called a nose job? The Houston Center for Facial Plastic Surgery is honored to have Dr. Bradford Patt, a prominent facial reconstructive surgery specialist, offer and perform rhinoplasty surgical procedures in Houston. Dr. Patt is one of the few dedicated board certified plastic surgeons who specializes in rhinoplasty in Houston, and its various nose job techniques; therefore, many patients look to Dr. Patt’s education and expertise before having nose reconstruction. Rhinoplasty is the official medical procedure term for what is commonly called a nose job. Rhinoplasty comes from the Greek words: ῥίς rhis (“nose”) and πλάσσειν (“to shape”). A nose job, or rhinoplasty procedure, is facial reconstructive surgery which can be an option to for patients who wish to aesthetically enhance the look of their nose. Rhinoplasties are typically performed in cases where a person may be dissatisfied with the appearance of their nose, or due to an accident where there is internal and/or external damage to the nose. Moreover, nose reconstruction surgery is not always just for aesthetic plastic surgery purposes, it is also performed to correct or reconstruct the form of the nose, in order to restore proper functionality. This may involve resolving a congenital defect, nasal trauma, or respiratory impediment; these are all considered medical reasons for surgery. In our experience, plastic surgery of the nose, or rhinoplasty, is one of the most gratifying and rewarding surgeries for patients. Changing the appearance of the nose can have dramatic effects on your physical appearance, while (in most cases) allowing you to return to normal life remarkably fast. This procedure involves re-contouring the cartilage and bone of the nose, while maintaining, or even improving, the breathing function of the nose. Our special expertise in this area comes from training in both otolaryngology (ear, nose and throat), and facial reconstructive surgery. Both men and women who have attained full growth into adulthood are good candidates for this procedure. Preoperative consultation for rhinoplasty involves a personal discussion with Dr. Patt on what changes are desired, photographs, and computer imaging, as to show the patient the likely results. The procedure can be performed along with internal nasal surgery to improve the breathing function of the nose. Typically, nose reconstruction is performed as outpatient surgery, and most patients can return to their daily activities within one week, and can resume exercise within four weeks postop. One of Dr. Patt’s education goals is to help rhinoplasty patients gain a certain level of insight into surgical procedures. Below, Dr. Patt explains the two basic types of rhinoplasty procedures- the endonasal approach, and the external approach. All surgical incisions in this procedure are done on the inside of the patient’s nostrils. No part of any scar or incision done in this procedure after healing is externally visible. Though this procedure results in a visible scar being prevented, challenges and technical limitations associated with this approach are considerable, because there is a lack of surgical access. This lack of access is simply the fact that the complete operation is done through narrow openings and with somewhat limited visibility. Ultimately, endonasal rhinoplasty is done to reconstruct the nasal septum or recontour the look of the nose from the inside of the nostrils. Swelling and bruising tend to take a bit longer to subside, and recovery time may be longer with this type of nose reconstruction technique. A small incision, known generally as a bridging incision, specifically called a trans-columellar incision, is made to connect the right and left nostril incisions. This is the main difference that distinguishes the open approach to rhinoplasty from the closed approach. Like the concept of opening the lid of a chest, this incision allows a flap of nasal skin to be folded upward, and brings to light direct and unhindered visibility of the lower nasal skeleton. This basic incision also allows the facial plastic surgeon better access to the entire nasal framework, which is of great advantage as the procedure is performed. Another advantage of the open approach is that the distortion of the nasal cartilage is minimized compared to the distortion that is almost inevitable when using the closed approach. There is always the modest risk of a visible scar; however, that is usually greatly offset by the improved platform for diagnostics, flexibility and variation, as well as the improved accuracy and effectiveness that is possibly achieved when compared to the close approach. Yet, in a vast majority of cases, an open approach to rhinoplasty will be the preferred procedure. 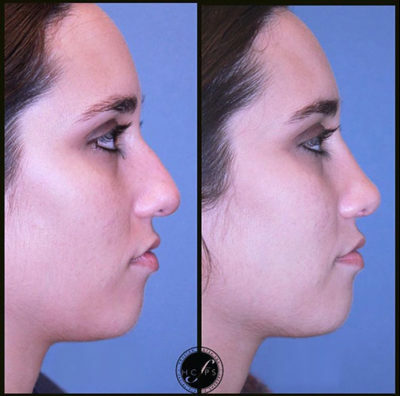 In fact, some of the most successful breakthroughs in effective rhinoplasty techniques can only be done utilizing the open approach. If you are seriously considering rhinoplasty, or a nose job, the Houston Center for Facial Plastic Surgery is the best place to start because Dr. Patt is available to help you obtain a professional and expert evaluation, and the best recommendations. In addition, as part of the scope of his practice and specialty, Dr. Patt also performs non-surgical rhinoplasty. This innovative concept or methodology utilizes filler injections in order to manipulate the shape of the nose without permanent and invasive surgery. The benefits of non-surgical nose jobs include, and are not limited to, little to no recovery time, as well as lower associated cost. Schedule your consultation today, or call us today at (281) 649-7170 for more information or to schedule an appointment below!